My latest book is now available on Amazon.com. It is called Book Cover Design Wizardry:For the Self-Publishing Author. 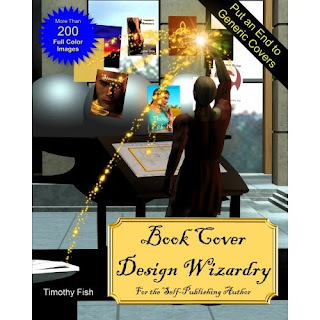 This book give detailed instructions on how you or anyone else can create a book cover for very little money. In fact, the primary tools are free. This book is printed in full color with more than 250 illustrations. What Makes a Great Self-Publishing Project? What makes a great self-publishing project? Novels typically don’t. We know that the most successful self-publishing projects are usually those in which the author is a speaker and can sell his books at the back of the room. Well, a friend told me about another kind of project that seems like it would make a great self-publishing project. He told me that his mother works in children’s ministry at church. As part of the ministry, she make use of puppets. She has been writing her own scripts—hundreds of them—and giving them out to other people to use. I believe this makes a great self-publishing project because the work of writing the scripts is already done or would be done anyway as a part of her ministry. All that really needs to be done is for someone to bind them in books and make them available for people to buy. The editing is already done. There is no need for her to try to convince a publisher to take on the project. She can put the scripts out there for very little cost to her and see if people are interested. If they are, great! She has made some money for from the work she is doing. If not. What has she lost? She would have created the scripts anyway. Opportunities like that don’t present themselves every day. A few bloggers encounter that, but how nice it is when we can find a way to make money from content we would be generating whether we were selling it or not.